THE FATE OF THE WORLD IS IN HIS HANDS. 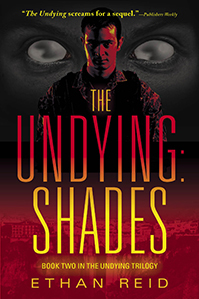 The Undying: SHADES finds American student Jeanie and her young charge, Ren, fifteen years after the EMP that wiped out Paris and sent them on the run from the undying. Walking the highways and hiding out in abandoned buildings across France, they eventually find their way to Spain and the walled city of Ronda where a few dozen survivors have gathered safe enough from the hunting undying, but facing a new threat on the scorched planet: starvation. With their main resource humans bordering on extinction, the undying have weakened, retreating to their hives and slowly withering away. But not for long. A dark presence arrives, casting its shadow across Spain, reawakening the hives and creating a new breed of monster. Driven by some alien intelligence, these Shades not only reanimate the undying, but can possess the living, turning survivors against one another.